All Over Print Dark Squirrel Shirt for Women and Men. A great big closeup shot of a squirrel! You can buy this squirrel shirt here. 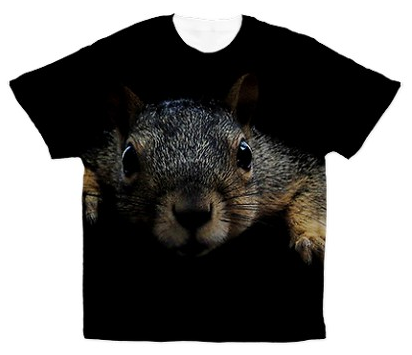 Kind of creepy, and an ironic counterpart to the big animal face shirts that show dogs and cats, this squirrel shirt is an in-your-face kind of design. While you won't be able to make your way down the street unnoticed, you will probably lift some hearts with this funny squirrel shirt. Because it has no text, it conveys whatever you want it to convey: it can be a gift for people who are plagued by squirrels in their attics, or for people who have their own pet squirrel that they love beyond compare. This style of all-over-print shirt is a new offering from Cafepress. Follow the link above to learn more.